What can the Labour Party unite around to win in 2020? 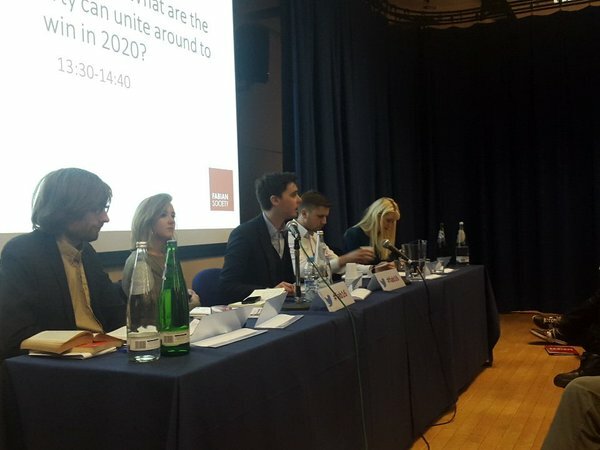 Today I spoke at the Young Fabians’ fringe event at the Fabian New Year Conference about what the Labour Party can unite around to win in 2020. You can read my remarks below. As Labour Party members we share the same values – of equality, solidarity and social justice. This means we’re starting from the same place when it comes to purpose and policy. We’re in a political party, as opposed to a charity or protest group, because we believe the most effective way of putting those values into practice is in government – showing we also agree on the method of taking action. If we’re going to win again, however, uniting among ourselves is not enough. We can’t just listen to those who already agree with us; we have to learn from why we lost the last election, listen to the voting public, and unite with them to create a much broader platform. We believe in solidarity and we therefore agree on the importance of a thriving trade union movement, organising in workplaces and getting more people to join trade unions – particularly in areas where membership is low such as the private sector and among the self-employed. We agree on fighting against the Trade Union Bill and for workers’ rights. Solidarity also demands that we play our full role in the world because as a party we have always believed we have a responsibility to others both at home and abroad. We don’t just stand by and ignore human rights abuses. We believe in equality and can therefore agree on opposing the Tory policies that are creating a more divided society. Our shared vision of a more equal society would see the end of exploitative zero-hours contracts, the bedroom tax, the gender pay gap, and an inadequate minimum wage. We agree that, despite the achievements of previous Labour governments, significantly more progress needs to be made for women, LGBT people, disabled people and black and ethnic minority people. And it’s exciting that there’s a growing consensus over taking power away from the centre and sharing it more equally among people: in our workplaces, our public services and so too in our politics. Our shared values give us a belief in equal opportunities, and the most important area, which we should agree to prioritise, is early years’ education. Life chances – including your chance of going to university – are determined at a young age. If we are really serious about equality of opportunity in higher education, the answer is intervention before the age of three. The priority has to be breaking the cycle of deprivation that prevents working class people getting on in life. In order to win, however, our agenda needs to reach out beyond those issues and we all need to come together to candidly assess why we lost. The simple fact is that we have only ever won – and been able to deliver on our values – when we have taken votes from the Tories. Those who voted for the Tories in May aren’t bad people. They are parents, grandparents, teachers and young people who want a better life for themselves and their families. They chose the Tories because our offer wasn’t good enough and we weren’t trusted to deliver on our promises – as I was told again and again on doorsteps across the country. We failed to win over enough people to form the Labour government that so many people in our country so desperately need. We win when we offer a credible alternative to the Tories’ plans. One which will deliver for the country as a whole – not just those at the very top or the bottom. That’s not just a tactical thing to win votes. If you’re going to govern you need to govern for the whole country. If we look at why we lost there are plenty of issues the public is clearly able to unite around – with the economy and leadership being at the top of the list. So, in setting our agenda, we must start by listening to them, uniting with them and not just with ourselves, and deliver the government that will deliver on the values we are united around. This entry was posted in education, equality, Labour Party, living wage. Bookmark the permalink.